50 years after Macmillan retired, what can Cameron learn from ‘SuperMac’? A slick Tory toff is Prime Minister. He struggles to maintain Britain’s status in the world, wrestles with disunity in his party, but seeks to win an election promoting a land of opportunity. 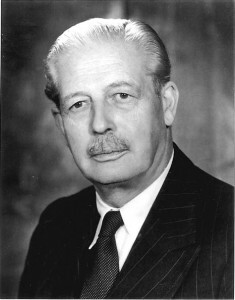 I refer not to David Cameron, but to Harold Macmillan, who resigned as Prime Minister almost exactly 50 years ago. So how does David Cameron compare to Harold Macmillan, and what can the current Prime Minister learn from ‘SuperMac’, the Conservative politician who served as Prime Minister from 1957 to 1963? Macmillan and Cameron are cut from the same cloth in that they can both be seen as actor-politicians. Both were and are superb at the set-piece occasions. Indeed, Macmillan’s motto, borrowed from Gilbert and Sullivan was ‘Quite calm deliberation disentangles every knot.’ He even had that quote pinned on his Cabinet door. Underneath, Macmillan was anything but calm: he was regularly sick before the weekly jousts at Prime Minister’s Questions. By contrast, Cameron is a natural leader in public and in private, conveying the air of someone born to rule. His Commons handling of the apologies over Bloody Sunday and Hillsborough were exemplary. He handles the big state occasions well. In short, he looks and sounds like a leader in a way that Ed Miliband doesn’t. Macmillan and Cameron face similar problems in relation to foreign affairs. One of Macmillan’s greatest achievements as Prime Minster was to repair the ‘Special Relationship’ with America, which had been blighted following the disastrous Suez adventure in 1956. Macmillan used his charm with Dwight Eisenhower, the American President to negotiate the 1958 Nassau Agreement, which governs the British-American nuclear relationship to this day. Fast forwarding to 2013, Cameron must repair the Special Relationship, following his recent humiliation over the Commons defeat on British military action in Syria. Both Macmillan and Cameron have had to reshape Britain’s relationship with Europe and have landed in trouble thanks to resistance from the French. Whereas Macmillan’s attempt to enter the European Economic Community in 1963 was met with a loud French raspberry from General de Gaulle, Cameron’s decision to promise an ‘In-Out’ referendum on Britain’s continued membership of the European Union in January 2013 has again upset our Gallic partners. The two Prime Ministers also share the problem of rebellious traditionalists in their parliamentary parties. For Macmillan, it was Empire loyalists who opposed his ‘Wind of Change’ decolonisation policies in Africa. For Cameron, it is a massive Tory right-wing, numbering more than a 100, who have opposed him on a whole range of issues from House of Lords reform to gay marriage. But if there are similarities between the two Prime Ministers, Cameron is different in that unlike Macmillan, he is prepared to move with the times. Macmillan hailed from an Edwardian era where men especially didn’t show their feelings. His prudishness about all matters sexual was cruelly exposed during the Profumo Scandal in 1963. Already haunted by the fact that his wife Dorothy was having a long-term affair with Lord Boothby, Macmillan froze and handled the issue badly. Ultimately, it contributed to his downfall. By contrast, Cameron is attempting to drag his party kicking and screaming into the twenty-first century by supporting gay marriage. Ever since Macmillan’s day, the British people have moved in an almost relentlessly liberal direction on social issues, and Cameron realises that he has to change his party to reflect that fact. In terms of economic policy, there is a huge gulf between Macmillan and Cameron. Macmillan believed in the so-called ‘Middle Way’, a happy medium between socialism and capitalism. Macmillan’s economic views were shaped from his experiences in the First World War when officers and men from different social classes mixed more easily than in the past, and during his encounters with his impoverished Stockton constituents in the depression years of the 1930s. Constantly fretting about the return of another depression ‘SuperMac’ wanted to go for economic growth, almost at any price. Many in his Cabinet disagreed. In 1958, Peter Thorneycroft, the Chancellor resigned along with his entire Treasury team in protest at Macmillan’s expansionist policies. In truth, Macmillan’s support for the ‘Middle Way’ is much closer to New Labour’s adherence to its ‘Third Way’. Were Macmillan alive today, he would be thrown out of the Conservative Party for being a socialist. In his retirement, remember, Macmillan attacked the Thatcher government for ‘selling off the family silver’ through its privatisation policies. When Alistair Horne, Macmillan’s biographer admitted that he wasn’t a very good Tory, ‘SuperMac’ replied, ‘Nor was I dear boy.’ As Cameron embarks upon flogging Royal Mail to investors and selling publicly owned banking shares at a discount price, he should heed Macmillan’s warning. Cameron could learn most from Macmillan in terms of his ability to win elections. Macmillan’s greatest triumph came in 1959 when he won a landslide majority of 100 against Hugh Gaitskell’s Labour Party. Labour had launched a highly professional campaign, making good use of television for the first time, but Macmillan trumped that by appealing to the British people’s innate love of the consumer society. Macmillan won big in 1959 because he realised that voters wanted a washing machine, a fridge and a television set. Cameron’s recent Conference speech where he extolled the virtues of a profit-making economy surely echoes Macmillan’s rallying cry of 1959. Although Cameron is unlikely to repeat Macmillan’s 1959 feat of winning an outright majority at the next election, he remains the Conservative Party’s biggest asset because he, like ‘SuperMac’ realises that elections are fought and won on the centre ground. The housing crisis: Supermac to the rescue? power, but these appliances are used for short duration, for example, your microwave oven. coming years even more vigorously. Moreover ensure that you have the correct tools for every repair. The Louisville-based appliance operation isn’t a large contributor to GE’s bottom line.